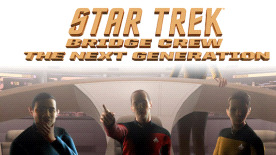 This product requires the base game Star Trek™: Bridge Crew. The Next Generation DLC enhances your experience of the base game. You need the base game to be able to play the DLC. Play with your friends cross-platform, either in VR or non-VR. It can be used in any of the existing Ongoing Voyages modes, plus the two new modes. Fly to your choice of star systems, and then we generate random events and challenges for you to meet along the way. A Borg Cube is tracking you, and you must complete a series of objectives to be able to fight back. How you assign people at any given moment determines the ship’s capabilities. The Romulans are deadly, making heavy use of surprise attacks. And a single Borg Cube is a nearly unstoppable threat. A permanent internet connection is required in order to play the game. Please note: This version of The Next Generation will only work with the Oculus version of the base game; for the Steam version please search for the Steam version.